UFO SIGHTINGS DAILY: Giant Axes Baffle the Experts, Evidence Of Giant Aliens, June 2016, Video, UFO Sighting News. Giant Axes Baffle the Experts, Evidence Of Giant Aliens, June 2016, Video, UFO Sighting News. Did a giant species of aliens once exist on on Earth? Most defiantly, but its difficult to comprehend for sure. Many UFO reports have reported seeing 3-5 meter tall aliens existing landed craft. Its really quite extraordinary and also makes me realize that the size of objects change incredibly throughout this universe. For instance, back in about 2007-2008 when I wrote to William Rutledge (about 80 years old) of Apollo 20, he told me about the inside of the cigar ship in Deporte crater that he explored...inside were glass-like tubes along its walls with tiny 2cm skeletons littering its inside, yet the pilot was 5.5 feet tall (retrieved) and was attached with an umbilical cord to the craft from her nose and other areas. Size is relative. What are the limits? Life...has no limits. A giant African lake basin is providing information about possible migration routes and hunting practices of early humans in the Middle and Late Stone Age periods, between 150,000 and 10,000 years ago. Oxford University researchers have unearthed new evidence from the lake basin in Botswana that suggests that the region was once much drier at certain times and wetter at other times than it is today. They have documented thousands of stone tools on the lake bed, which sheds new light on how humans in Africa adapted to several substantial climate change events during the period that coincided with the last Ice Age in Europe. Researchers from the School of Geography and the Environment at the University of Oxford are surveying the now-dry basin of Lake Makgadikgadi in the Kalahari Desert, which at 66,000 square kilometres is about the same size of present day Lake Victoria. Their research was prompted by the discovery of the first of what are believed to be the world’s largest stone tools on the bed of the lake. 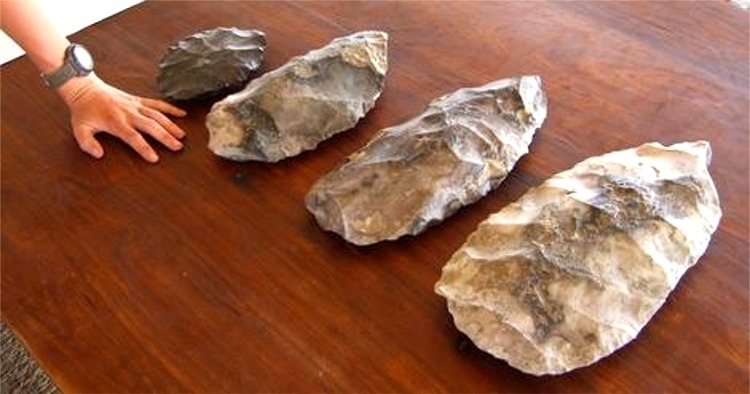 Although the first find was made in the 1990s, the discovery of four giant axes has not been scientifically reported until now. Four giant stone hand axes, measuring over 30 cm long and of uncertain age, were recovered from the lake basin. Equally remarkable is that the dry lake floor where they were found is also littered with tens of thousands of other smaller stone-age tools and flakes, the researchers report. Professor David Thomas, Head of the School of Geography and the Environment at the University of Oxford, said: ‘Many of the tools were found on the dry lake floor, not around its edge, which challenges the view that big lakes were only attractive to humans when they were full of water. 'As water levels in the lake went down, or during times when they fluctuated seasonally, wild animals would have congregated round the resulting watering holes on the lake bed. It’s likely that early human populations would have seen this area as a prolific hunting ground when food resources in the region were more concentrated than at times when the regional climate was wetter and food was more plentiful and the lake was full of water.’ (More at source).